After three decades, I’m starting to develop a sweet tooth. Thankfully, it’s still in its infancy; about three times a week I have a persistent craving for dessert – something unhealthy and satisfying like cake or ice cream. Over the holidays, it was easy to tame the beast with a slice of pie, scoop of ice cream, or the occasional fried pastry. However, after the momentous New Year came and went, a healthier long-term substitute was in order. As luck would have it, that’s when a box of Nature’s Path products arrived at my door. A variety of organic granola, cereals, and snack bars found at major retailers globally. If you like to root for home grown family-run companies, Nature’s Path fits the bill: started in British Columbia (where the headquarter remains) in 1985, the company remains family-run despite having over 150 products in its roster. While this is admirable and noble, what really matters to me is the taste - if it doesn’t leave me wanting more the company could be run by a group of disadvantaged nuns in my house and it wouldn’t matter. Of everything I’ve tried, two dark chocolate and peanut products were the best substitute for desserts. 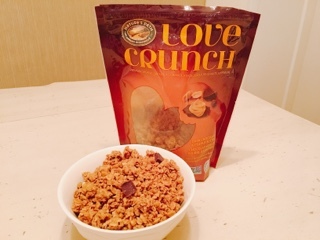 Both the Love Crunch and Qi’a Superfood bars are relatively newer products launched in 2011 and 2012, respectively. 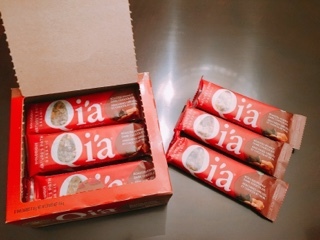 The Qi’a Superfood snack bar is the easiest: as soon as it’s unwrapped, you can bite into the soft chewy bar that ever so lightly melts in your mouth (thanks to the tapioca and brown rice syrups mixed with peanut butter). The chia seeds and coconut flakes add a cake-like texture, the roasted peanuts crunch, and chunks of dark chocolate a balanced sweetness. Let’s be honest, it’s not cake. Yet, a satisfying replacement and so good that I forget I’m consuming ingredients like chai and hemp seeds. The dark chocolate and peanut butter Love Crunch takes a bit more work. Sure, you can eat the crunchy clusters straight out of the bag, but it tastes even better when combined with something creamy. 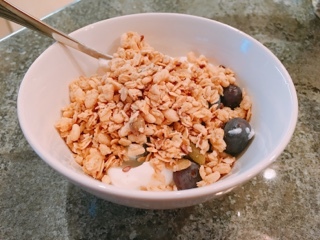 Generally, a hefty sprinkling of the granola over thick Greek yoghurt is how I’ve consumed it. The peanut butter and dark chocolate chunks provided enough sweetness that dissipated the tanginess of the plain dairy product. I’m a person who loves contrasting textures – the crunchy rolled oat clusters, creamy chocolate, and smooth yoghurt is a great combination. That blend already left me satiated. Then I heard the Love Crunch is even better with ice cream, which makes sense, as it could easily make a delicious parfait. 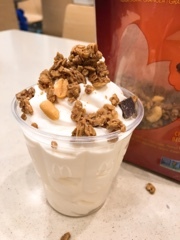 That’s when I ventured to get a cup of soft serve, to see if the topping would be delicious enough to replace my favourite hot fudge syrup and crunchy peanuts. Although I won’t be trading it in for a chocolate sundae yet, the combination is tasty when topped sparingly. 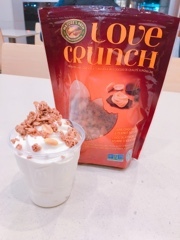 It can get a little sweet when you get a spoon with a huge granola cluster, so save the smaller pieces that fall to the bottom of the bag for a more suitable topping. For so long I’ve prided myself for being able to turn down dessert. After all, I eat out so often that some restraint is needed to keep from ballooning up. Hence, when the nagging sugar craving developed in 2016, I felt disappointed and almost betrayed by my desires. Thank you Nature’s Path for coming to the rescue, my waist-line thanks you for it.